A stocking and a stocking cap for this snowman. I’ve left the faces, stockings and caps blank to give the kids lots of ways to make their project unique. I love his tinsel arms. Finish only one side and hang it to the wall or bulletin board, or add a piece of cord to hang. 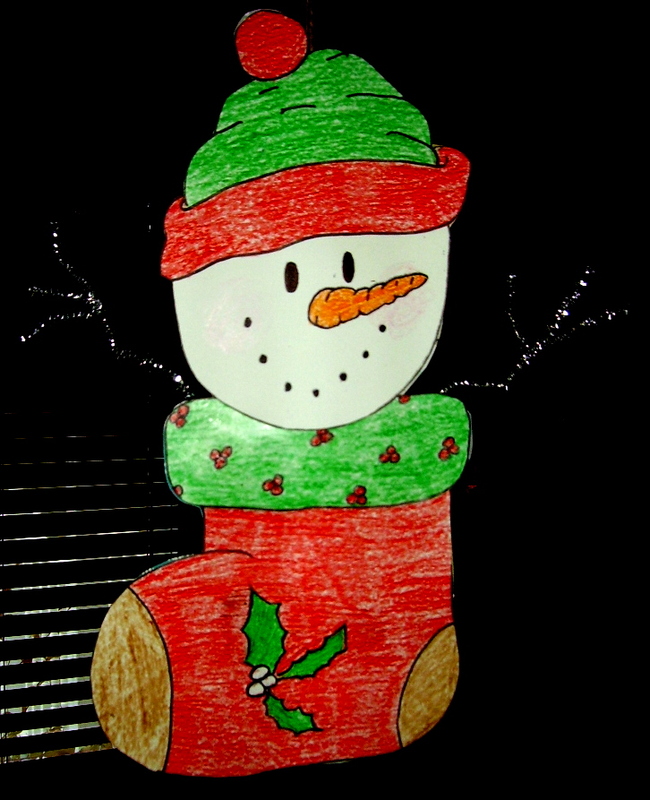 I have this project, “Snowman Stuffed Stocking,” in the 3rd Grade Projects Gallery in the sidebar, but it’s a very easy project and I think any grade can do it. This entry was posted in 3rd Grade, Christmas Projects and tagged 3rd Grade, christmas crafts for kids, christmas projects, christmas projects for kids, classroom hanging snowman, easy classroom projects, hanging stocking, snowman, snowman stuffed stocking, stocking and stocking cap. Bookmark the permalink.